Create an index using a typewriter and office copier. Clear labels virtually disappear on white divider tabs. 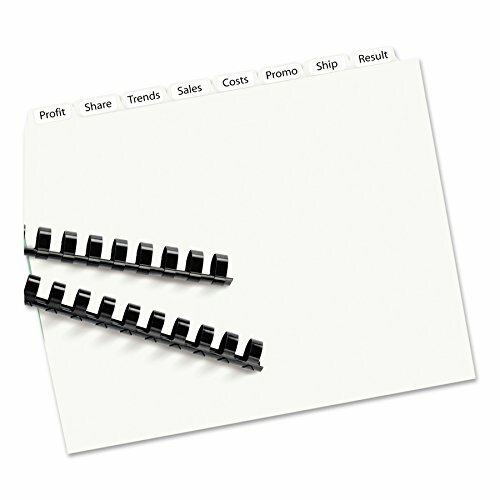 Choose unpunched tab dividers to create professional-looking customized bound documents right at your desktop. Great for use with comb or wire binding systems. Clear labels virtually disappear when applied to tabs. Save time by labeling all tabs at once using Easy Apply™ label strip. Easy to customize with free templates and designs at Avery Design & Print. For laser and inkjet printers. Tab Style: 8-Tab; Tab Color(s): White; Index Divider Size: 11 x 8 1/2; Form Quantity: 25. Whether you're organizing a single project or creating multiple sets, Avery Index Maker dividers give you a professional look. 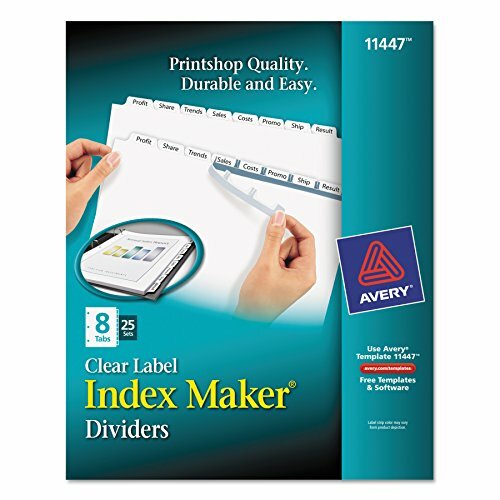 Clear labels virtually disappear on divider tabs to give your dividers a printed-on look. The Easy Apply label strip lets you label all tabs at once. Creating tabs labels for one or more divider sets is quick and easy using free Avery design tools and templates. amp;quot;Big Tabamp;quot; and amp;quot;Extra Wideamp;quot; selections offer greater convenience in office-wide references standard selections provide streamlined indexing in planners and personal binders. For laser and inkjet printers. Tab Style: 12-Tab Tab Colors: White Index Divider Size: 11 x 8 1/2 Form Quantity: 5. Is your presentation dressed for success? It will be with these Index Maker Clear Pocket Clear Label Dividers. They feature pockets that provide room for colorful section title pages or handouts. Clear labels add a professional look that will make your presentation stand out. And with free templates from avery website, you can customize the tab labels and print them on your laser or inkjet printer in no time. Now you're ready to knock their socks off. 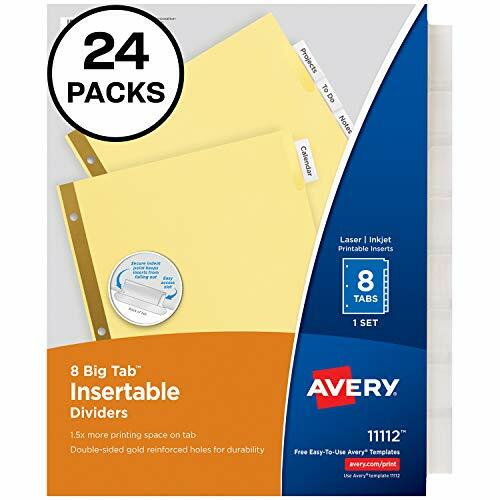 Avery 8-Tab Binder Dividers with Insertable Big Tabs are a fast and simple solution to paper organization. Big Tab dividers provide enhanced tab visibility with 50% more writing space than standard divider tabs, allowing for bigger fonts and handwriting. Special tab design keeps inserts locked in during use, but the easy-access slot makes them painless to remove. These page dividers are made of durable buff colored paper, with double-sided gold reinforced holes that are tear resistant so you can flip through your 3-ring binder with confidence. Sturdy and built to withstand everyday use, this clear set of 8-tab dividers is great for organizing schoolwork, personal finances, recipes, coupons, sheet music, or anything else that needs sorting. Tabbed dividers are 3-hole punched and ready for immediate use. For a clean, professional look, personalize your page tab inserts using free templates, fonts and designs at avery.com/templates. Inserts are compatible with laser and inkjet printers. 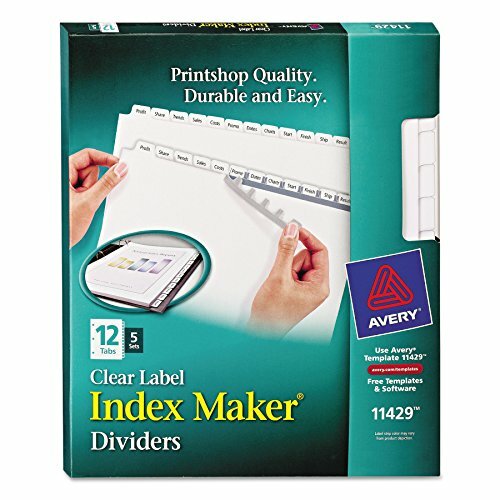 Looking for more Avery 8 Tab Clear Label Dividers similar ideas? Try to explore these searches: Ruud Blower Assembly, Vivaldi Bassoon Concerto, and Little Tikes Riding Toys. 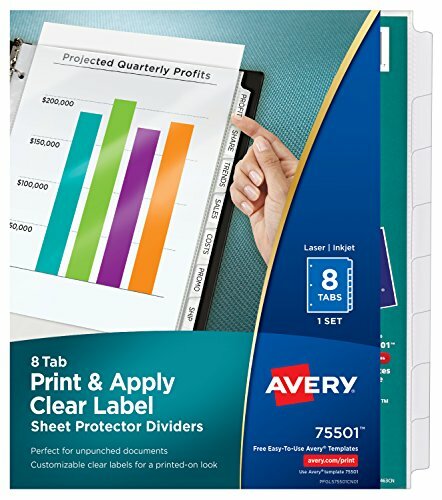 Look at latest related video about Avery 8 Tab Clear Label Dividers. Shopwizion.com is the smartest way for online shopping: compare prices of leading online shops for best deals around the web. 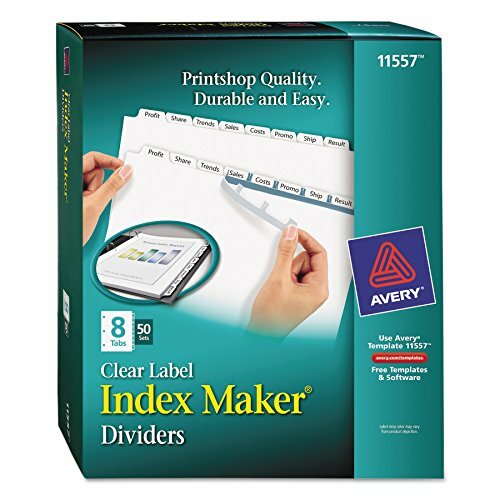 Don't miss TOP Avery 8 Tab Clear Label Dividers deals, updated daily.